The common hepatic artery is a medium-sized section of the celiac trunk. It splits within its two concluding sections after it travels towards the right, the hepatic artery proper along with the gastroduodenal artery. The hepatic artery proper rises within the free edge of the lesser omentum towards the liver. It goes to the left of the bile duct and also anterior towards the portal vein, and splits within the right and left hepatic arteries around the porta hepatis. As the right hepatic artery reaches the liver, it produces the cystic artery towards the gallbladder. Gastroduodenal artery emerges on the upper border of the first of the duodenum. It goes downwards at the back of the duodenum and ends by subdividing within right gastroepiploic and superior pancreatic duodenal arteries at its lower border. Right gastric artery emerges simply distal towards the origin of gastroduodenal artery. It relies on the left and runs up along the lesser curvature of the stomach. Hepatic artery proper is the extension of the common hepatic artery. It produces right and left hepatic arteries on the porta hepatis. The right and left hepatic arteries circulate the right as well as left physiological lobes of the liver, specifically. 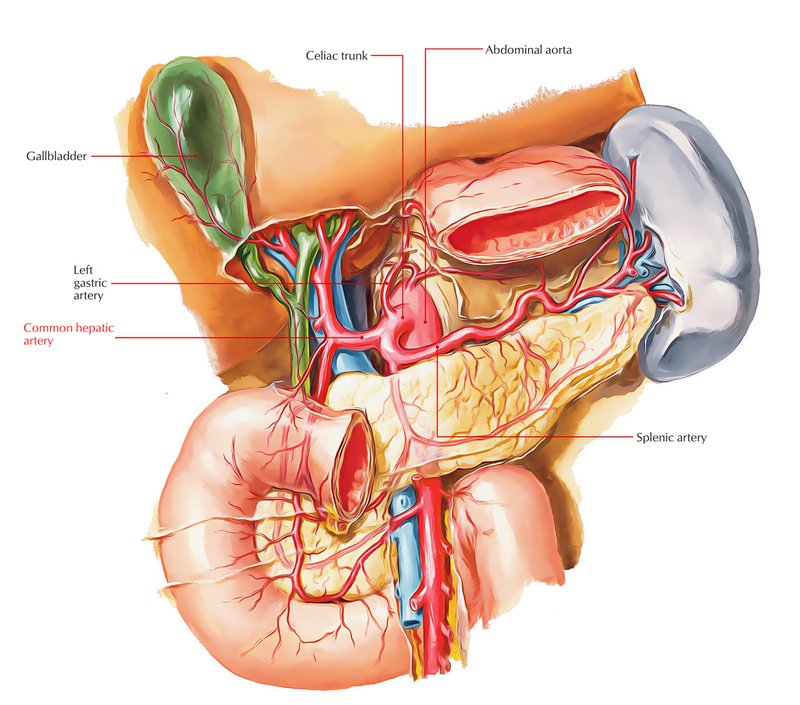 The right hepatic artery provides beginning to cystic artery in order to supply the gallbladder.